Could this man be Mogambo? If not, who is he and what does he want? Why does he sport a walking stick just like Mogambo’s? Can Ratan’s super-duper lung power stretch to fifteen minutes? And who is this new fellow? Was there a big sale on Mogambo Walking Sticks? Meanwhile, Man With Stick #1 and Seema spy on Mike and Pinky. 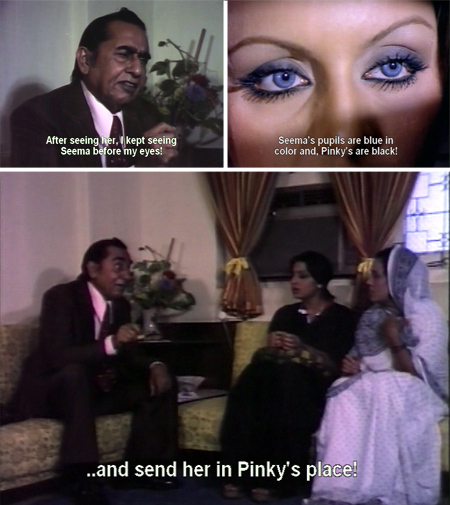 Seema takes Pinky’s place! Will Mike or Mogambo notice? Or Ratan? What will happen to Pinky?! Join us next time to see if our hero can survive for twenty minutes in the dreadful Room of Ice! Posted on July 7, 2008 at 8:35 am in Hindi movies	| RSS feed You can skip to the end and leave a reply. LOL The room of ice! Doesn’t it seem like something a person would want during an Indian summer? Or maybe a clever marketing ploy for air-conditioned rooms at Hilton? Anyway, this keeps on getting better. I’m all for the necessary fifteen-minute lung power! This is so bizarre. Can’t make any sense of it. So, yours is the best option. Nonsense. Yup, it made no sense at all. Had lots of fun things in it, but I gave up early on trying to figure out what the plot was (if there was one). The Room Of Ice is quite simply one of the most hilarious things I’ve ever seen (you’ll see!). 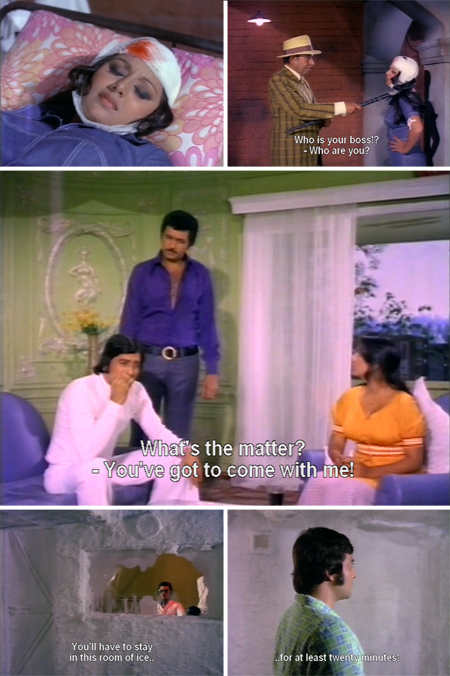 And Vinod in tight swim trunks: worth the price of the DVD alone. Blue pupils? That’s kinda interesting. Do you think they meant eyeballs? But hey, thanks for this review… I know it isn’t over yet, but I’ve already added this movie to my list of `avoid like the plague’ flicks! What the…?? The room of ice? Black and blue pupils? This is totally bizarre! 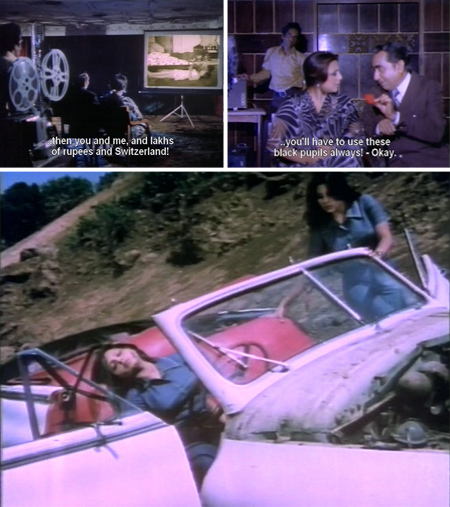 But the subtitles are really funny and I am still loving the ‘hotness’ of Vinod and Neetu – only Vinod could lovingly stroke his own thigh while wearing that miniscule stripey thing – and still manage to look cool. (Usually I try not to expose my… er… shallow side too much, but with a film like this, who cares?) Bring it on Memsaab! Ha! these films are made ONLY for people’s shallow sides. Otherwise—why bother? rofl – this just gets better… I want red pupils and green ones! Jwala’s pupils frightened the hell out of me—they were so obviously painted by some costume designer or something. Aruna could have gone blind or something! As a contact lense wearer, I was also concerned for her eye safety in those scenes. Bollywood sacrifices so much for us viewers! Hee :) Sometimes you just don’t even really need subtitles (although they always add to the fun! 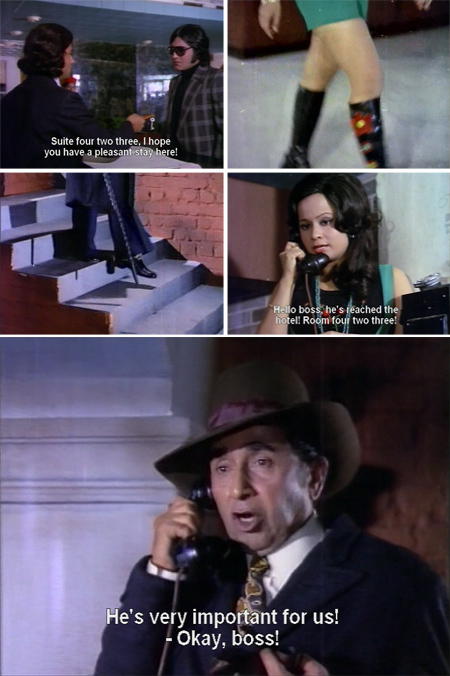 )…I’m looking at Chandni right now and it is HIGH-larious!